Magda Biernat. Betel Nut Beauties #2 Taiwan. 2008. 36 x 36 in. (on 40 x 40 in. paper). Change Observer: When and why did you take on this subject? 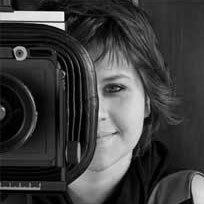 Magda Biernat: The photos were taken during a whole year of travels that my husband and I did between 2007 and 2008. Just wandering through the streets and suburbs of Taipei, I noticed these brightly lit structures on almost every corner. As an architectural photographer I’m drawn to modular, self-contained little buildings — I’m not sure why. I had previously done a series called “On Watch” of guardhouses and -towers. My husband’s sister-in-law is Taiwanese; she gave us an overview of the betel nut industry and the controversy of whether these skimpily dressed girls were doing more than just selling betel nuts. I got in touch with the photographer Tobie Openshaw in Taiwan, who had photographed them. Through him, I was introduced to the girls. I used a translator to talk to them and see what they thought about the industry. CO: Did you ask straight out if they were involved in prostitution? MB: Yes, and they said they weren’t. They wanted to look pretty and develop relationships with the customers. But according to them, it’s a flirting relationship, and nothing else. In Taiwan, there are two types of betel nut stores. You have typical mom-and-pop shops and then you have glass structures with pretty girls selling them mostly to truck drivers. Many of these girls said that in the future they would like to run the stores themselves. One of the controversies is that the girls are used in a male-dominated business that doesn’t pay them enough. But we also found a lot of situations where the owners were women who were past betel nut beauties and had bought the stores from previous owners. There were signs that the business was empowering women. CO: Have the controversies you mention led to any kind of activism? MB: Not that I know of. But we heard that at some point the government applied rules that the girls had to cover their tops and wear longer skirts. CO: So the women in your photos may be dressed more modestly than in the past? CO: What do you think about the architecture in your pictures? MB: There’s a double meaning or use for the space: on one hand it’s a dwelling and serves as a shelter; on the other hand, with those glass windows, the women are totally exposed, and it’s not a shelter because they can’t hide anywhere. I was also looking at those containers and shipping boxes used for storefronts. It was probably the cheapest way of building a store, but from our perspective it’s an inspiring reuse strategy. Magda Biernat was born in Poznan, Poland. She moved to the United States in 2002, first settling in Seattle. After relocating to New York in 2004, she started working for Magnum Photos. Biernat was introduced to architectural photography by Norman McGrath, with whom she studied at Maine Photographic Workshops and later assisted. She is currently the photo editor of Metropolis magazine.